Las Vegas Entertainment presents 3 NEW amazing Illusionist and Magicians for a night of "How did he do that? It's "House of Magic, Magic and Illusion Show". Witness, or perhaps, you didn't? 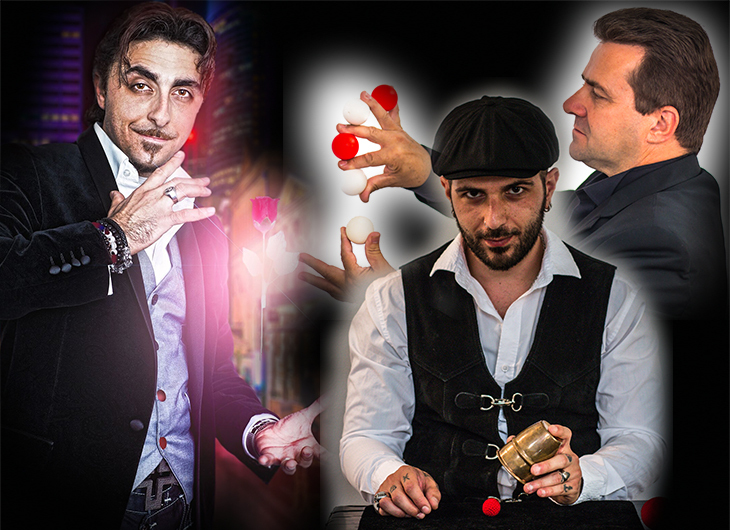 Some of the most mystifying, head scratching, can't be explained, Illusions and Magic from the Amazing Patrick James Archer (Effects to leave you scratching your head andclutching your wallet) Mark Williams ( manipulation, coins and billiard balls combined with juggling. Card trick performed standing on one arm. ) and back due to popular demand Jack Daniels (Rock Star illusionist, Channel 7 Sunrise) Hosted by USA’s Donte D1. Book your tickets, grab your seat and be apart of this spell binding, high-energy experience! 2 shows only. Family Show at 2pm and 4pm. Tickets on sale now. Hurry before they all disappear. Seats are slightly higher at the door or pre book and get the V.I.P Front 3 row seats which include drink choice and discount Centro Cinema parking. All family shows include ( lucky door prizes for the kids). Our last 3 magic and Illusion Shows Sold out, Hurry before all tickets disappear. Drink and Discount City Parking Show packages available.